In these stories of novelistic breadth, Shivani takes the measure of the fallout from globalization as well as its advantages, exploring cultures old and new to gauge their ultimate resiliencies. An undocumented Indian worker in Dubai, an Issei man in a California internment camp, a persecuted minority novelist in contemporary Tehran, and a loyal-to-the-core Jewish trader in the Ottoman empire are the kinds of sympathetic characters who bridge place and individuality in this powerful collection. These stories make us confront the hardest intellectual challenges of the emerging world, without losing narrative urgency, concision, and lyrical power. “Caustically funny, broadly knowledgeable, and sharply attuned to the tectonic shifting between tradition and change and the friction between immigrants and natives, generations, and genders, Shivani touches on injustices intimate and planetary in extraordinary stories of weight and luminosity.” Read the rest of the review by Booklist. “His is a controlled, quiet voice…The range of subjects on display in Anatolia reclaims the word cosmopolitan from the clutches of fashion, restoring it to what I take to be its true meaning — a mature mind (and imagination) that looks outward to embrace the globe.” Read the rest of the review by Catherine Browders in New Letters. “So it is a relief to plunge into the richly textured world of Anis Shivani, a world that is complex and multicultural…Shivani displays an astonishingly broad and deep knowledge of cultures…And not only does he write about globalization with authority, verve, and intelligence, but with originality, too.” Review by Garry Craig Powell in American Book Review (not available online). “Anatolia and Other Stories allowed me to revisit the experience of existing “in between” countries and cultures. The book reminded me it is possible to belong to more than one cultural tradition.” Read the rest of the review by Marian Haddad in Texas Observer. 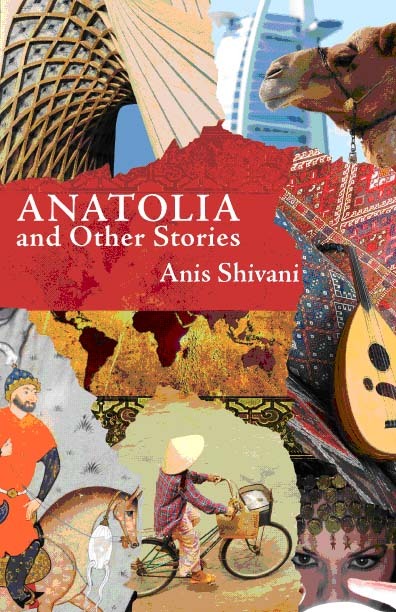 “Anatolia is replete with fine stories which transport the reader into cities, countries, and minds that are both strange and completely familiar. Shivani’s complex but clearly rendered vision encompasses war, corruption, economic growth, social movements, globalization, but locates full-fledged individual characters within these larger forces.” Read the full review 360 Main Street. “[Shivani’s] stories provide background for recurrent themes of class distinction, minority status, adherence to or defiance of the status quo, and the ubiquitous influence of authoritarian rule, and they reflect a stream of conflict between past and present, ancient and modern.” Read the rest of the review by Lee Mhatre in Confrontation. “Imaginative, informed, at times brash, Anis Shivani will go far.” Read thefull review by Brooklyn Rail. “Anatolia and Other Stories sees the promise of the marginal to the processes of change…The volume interweaves, in demonstration and in statement, the lessons of becoming attuned to the processes of transition.” Review by Cameron Bushnell in the South Carolina Review (not available online). National Book Critic Circle Board Member Rigoberto Gonzalez picks Anatolia and Other Stories as the Best Small Press book of 2009.